Floor Coverers measure, cut, and install carpet, artificial turf, linoleum, soft tile, vinyl, wood, and laminate flooring, laminate countertops, and wainscoting. 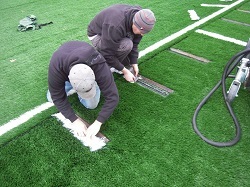 Work is often completed in office, homes, hospitals, stores, restaurants, athletic fields, and many structures. Workers in the floor covering trade must be able to work with plans and/or blueprints and apply math skills to measure, estimate, and install the materials for the best possible finished product. Workers in this trade must also be able to inspect surfaces for imperfections and know how to correct flaws prior to beginning work. Skills needed to become a floor coverer include manual dexterity, eye-hand coordination, physical fitness, math skills, a good sense of balance and color, and an eye for detail. 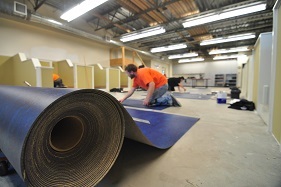 The floorcovering apprenticeship is a 4 year program. The apprenticeship consists of 8000 hours of on the job training and 144 hours of trade related classroom instruction per year. Classes generally are scheduled in (2) day block sessions monthly September thru June. FTINW's flooring program presents skills and new product training for journey workers, as well as schooling on environmental responsibility such as materials recycling and sustainable materials use. Please contact FTINW for more information.